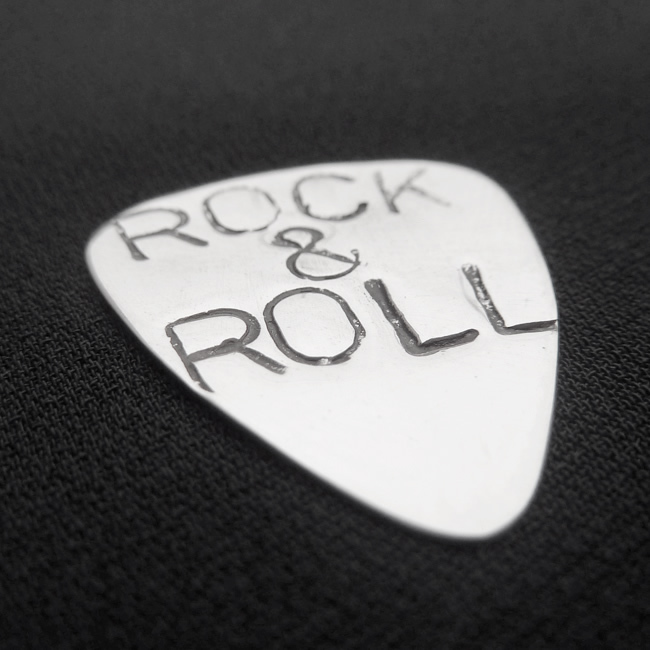 An understated personalised guitar pick from LWSilver. Handcrafted from solid sterling silver featuring a punched letter effect with a matt finish. Can be used to play both electric and acoustic guitars giving a rich bright tone. The perfect gift for a guitarist. Availability: 4 in stock Size: N/A Categories: All Jewellery, Mens Jewellery, Commissions, Wedding Jewellery, Wedding Gifts. Tags: bespoke, bespoke silver, church, commission, cufflinks, designer, handmade, handmade silver jewellery, jewellers, jewellery, jewellery Liverpool, jewellery maker., liverpool, LWSilver, male, mens jewellery, north west, north west jeweller, personalised guitar pick, plectrum, silver, silver pick, silver plectrum, silversmith, wedding rings, wirral. Why not choose your own letters. Maximum 12 letters.